Usually Pixar puts out one animated movie a year, but after 2013’s Monsters University, they skipped 2014. The studio did something unprecedented in 2015, though: for the first time ever, Pixar produced two new movies. Inside Out arrived first, as it hit screens in June. The film became a smash hit, as it took in more than $850 million worldwide and earned consistently excellent reviews. As I write this five days before the Oscars, it seems like a lock to win the award as Best Animated Festure. The Good Dinosaur arrived in November, and it received a much more tepid greeting on all fronts. It got decent but fairly unenthusiastic reviews, and audiences didn’t seem terrible excited about it. With $121 million in the US, it made barely one-third of Inside Out’s take, and it did about the same overseas. Dinosaur ended up with $306 million worldwide, which is nothing to sneeze at, but it seemed awfully low for Pixar – indeed, Dinosaur became the studio’s weakest-grossing movie ever, even without adjusting for inflation. Set in an alternate reality where their kind never went extinct, we see how dinosaurs continue to thrive past their expiration date, and they co-exist with primitive man. We meet an Apatosaurus clan: father Henry (voiced by Jeffrey Wright), mother Ida (Frances McDormand) and kids Libby (Maleah Padilla), Buck (Marcus Scribner) and Arlo (Raymond Ochoa). The youngest and tiniest of the bunch, Arlo feels like his small size creates problems as he finds it tough to contribute to the family farm. Determined to earn his keep, Arlo traps a feral caveboy (Jack Bright), a human who steals the family’s food. Though he’s supposed to kill the scavenger, Arlo can’t do the deed so the boy escapes. Henry takes Arlo to find the caveboy but disaster ensues when they encounter a flash flood. This sweeps away and kills Henry. Without the patriarch, the others try to get by but struggle. When the caveboy returns, an angry Arlo chases him and they both end up lost far from home. We follow Arlo’s attempts to get back to the farm as well as the unlikely bond that develops between the dinosaur and the human he eventually names “Spot”. I’d like to proclaim that Dinosaur delivers an unappreciated classic, but unfortunately, the film largely leaves me cold. On the positive side, like all Pixar efforts, this one gives us a professional effort, and it boasts excellent visuals. Pixar has done a lot to advance computer animation over the 20 years since Toy Story, and the benefits of that labor show during Dinosaur. In particular, locations and backgrounds excel, as they seem virtually photorealistic and immersive. Unfortunately, I get the feeling those involved with Dinosaur devoted so much effort to the animation that they forgot to create a compelling story and interesting characters. Virtually everything about Dinosaur seems generic. The plot doesn’t remake Lion King, but it echoes it too much for comfort, and the various participants never manage to emerge from their anonymity. This becomes a massive hole at the heart of the film. Arlo, Spot and all the others lack much in terms of true personality. They come across as archetypes more than actual characters, and they offer roles we’ve seen in many other films. Nothing about their depiction here allows them to develop on their own. The story itself couldn’t be much more generic as well. Granted, there’s nothing wrong with a story of this sort, as the basic quest framework can serve to tell an entertaining fable. Unfortunately, Dinosaur doesn’t work in that regard. Little fun or humor results, and attempts at action/excitement also fall flat. The tale waddles along without much real purpose and it remains dull. I won’t criticize the voice actors, but I won’t praise them, either. The performers read their lines with reasonable conviction, but they can’t add any sparkle to the flat script. They’re stuck with dead-end parts and fail to enliven the proceedings. None of these issues make The Good Dinosaur a genuinely bad film, but it seems curiously devoid of personality. Pixar usually invests real heart and emotion into their films, but they can’t do so for this lethargic, uninvolving tale. The Good Dinosaur appears in an aspect ratio of approximately 2.39:1 on this Blu-ray Disc. 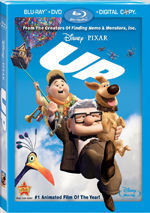 I expect greatness from Pixar Blu-rays, and this one lives up to past visual glories. Sharpness seemed immaculate. Even in the widest shots, the movie looked tight and concise, without a smidgen of softness on display. The image lacked jaggies or moiré effects, and edge haloes remained absent. Of course, I saw no print flaws, mainly because – like other computer-animated flicks – this one never needed to touch film. Given its settings, the palette embraced the natural feel one would anticipate. Occasional examples of stylized hues appeared, but most stayed with realistic tones that tended toward green to match the lead dinos and other outdoors elements. Colors seemed rich and full. Blacks were deep and tight, while low-light shots appeared smooth and easily visible. This was a stunning visual presentation. I also felt pleased with the immersive DTS—HD MA 7.1 soundtrack of Good Dinosaur. With a mix of natural environments and action scenes, the soundscape managed to fill the speakers in a smooth, engulfing manner at all times. Quieter moments boasted good ambience, while louder sequences packed a nice punch. From flying creatures to dino vs. dino battles to the roaring river to storms, various components blended and moved in a highly satisfying way. Audio quality also seemed strong. Music was full and rich, while dialogue came across as natural and concise. Effects showed appropriate clarity and accuracy, with excellent low-end response. The soundtrack added zest to the proceedings. When we shift to extras, we start with an audio commentary from director Peter Sohn, supervising technical director Sanjay Bakshi, story supervisor Kelsey Mann, supervising animator Michael Venturini, and director of photography/lighting and visual designer Sharon Calahan. All five sit together for a running, screen-specific discussion of story/character/thematic domains, inspirations, research and influences, music, cinematography, animation and effects, and related topics. Pixar commentaries usually work very well, and this trend continues with Dinosaur. The track moves at a nice pace and covers a good array of topics. Actually, the actors get the short shrift, as we hear surprisingly little about them, but otherwise, this seems like a pretty thorough chat. A short that ran in front of Dinosaur theatrically, Sanjay’s Super Team runs seven minutes, seven seconds. It shows a superhero-obsessed boy who eventually channels his fascination into an expression of his Indian culture. It offers some cute moments but seems a little heavy-handed and forced. Three Deleted Scenes come next. In addition to an introduction from Peter Sohn (0:35), we get “The Attack” (2:29), “Building the Silo” (4:30) and “Waiting for Poppa” (3:05). All of these tell us more about the relationship between Arlo and Poppa. Some interesting beats occur but they don’t add much. Some featurettes follow. True Lies About Dinosaurs runs one minute, 56 seconds and discusses facts vs. the movie’s fiction/liberties. It offers a brief but cute lesson. With the six-minute, 19-second Recyclosaurus, as we learn about how Pixar embraces “creative competitions”. In this case, employees needed to use used household items to make dinosaur creations. This feels a little self-congratulatory but it’s fun to see the designs come together. The Filmmakers’ Journey goes for seven minutes, 54 seconds and features Sohn, Bakshi, Calahan, Venturini, Mann, production manager Ann Brilz, and effects supervisor Jon Reisch. “Journey” examines location scouts and how research impacted the film and crew. A smattering of decent details emerge, but the end result feels fluffy. During the six-minute, eight-second Every Part of the Dinosaur, we hear from Sohn, Venturini, and animators Jessica Torres and Claudio de Oliveira. “Part” looks at animal research and animation techniques. Like its predecessors, “Part” can feel self-congratulatory, but it offers some nice insights related to animation/character challenges. Next comes Following the T-Rex Trail. It takes up six minutes, 58 seconds and features Sohn, Brilz, Mann, Venturini, cattle rancher Joe McKay and children Anna, Gabe, Clare and Luke. We learn about the McKay family and how a visit to their ranch influenced the film. Some of this material appears during the commentary, but the addition of visuals adds to the experience. Dino Bites occupies four minutes, 15 seconds. It gives us a collection of little animated tidbits that feature the movie’s characters. These prove to be mildly interesting. Finally, Hide and Seek lasts a mere 59 seconds. It gives us a short in which Arlo and Spot play a game together. Like “Bites”, it seems cute but insubstantial. The disc opens with ads for Finding Dory and Zootopia. Sneak Peeks adds promos for the state of Wyoming, Disney Parks, and Disney Stores. A second disc provides a DVD copy of Dinosaur. It includes the commentary and Sanjay’s Super Team but lacks the other extras. 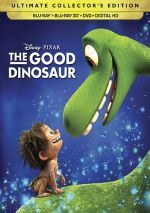 After the excellent Inside Out earlier in the year, Pixar falters with The Good Dinosaur. Bland and forgettable, it offers one of the studio’s weakest efforts. The Blu-ray provides terrific picture and audio along with a mostly interesting set of supplements. 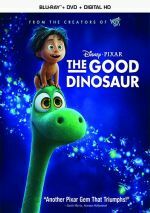 Good Dinosaur winds up as a mediocre animated adventure.